The solar kit 1000-6 has a solar fraction of approximately 60% for a daily hot water consumption of 1200 litres in the region of Lisbon (equivalent to 30 showers – 40 litres per person). It has a total efficiency of about 48% and an annual production of nearly 13.339 kWh. The solar kit 1500-8 has a solar fraction of approximately 67% for a daily hot water consumption of 1600 litres in the region of Lisbon (equivalent to 40 showers – 40 litres per person). It has a total efficiency of about 54% and an annual production of nearly 19.865 kWh. Tubes and insulation not included. The solar kit 2000-12 has a solar fraction of approximately 68% for a daily hot water consumption of 2200 litres in the region of Lisbon (equivalent to 55 showers – 40 litres per person). It has a total efficiency of about 50% and an annual production of nearly 27.773 kWh. The solar kit 3000-20 has a solar fraction of approximately 68% for a daily hot water consumption of 3400 litres in the region of Lisbon (equivalent to 85 showers – 40 litres per person). It has a total efficiency of about 47% and an annual production of nearly 42.879 kWh. The solar kit 4000-28 has a solar fraction of approximately 69% for a daily hot water consumption of 4000 litres in the region of Lisbon (equivalent to 125 showers – 40 litres per person). It has a total efficiency of about 50% and an annual production of nearly 64.356 kWh. 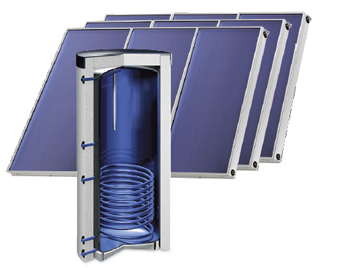 The solar kit 9000-56 has a solar fraction of approximately 73% for a daily hot water consumption of 9000 litres in the region of Lisbon (equivalent to 225 showers – 40 litres per person). It has a total efficiency of about 48% and an annual production of nearly 122.577 kWh.